Why the World Exist and Why there Is Life on Earth? These two are related questions, the second question more or less a subset or corollary of thefirst. So let us examine them together. These questions can be answered at various angles or levels: scientific,philosophical, spiritual and practical. According to modern science, in our solar system, life exists only onearth. There may be life in other earthsand other planets in the universe, in other solar system. But in our solar system life is there only onearth. And scientists also tell us thatif the carbon atom, which is the basis of life in our planet, has one electronless in its orbit, there won’t be any life in our planet. This means the entire earthly creation is sominutely planned to bear life. This also indicates, there must be some great purpose behind the world we live. You can now see how the two questions we are discussing, “why the world exist?” and “why there is life on earth” are closely related. So imagine you are some sort of an eternal Witness to the history of earth. At the beginning there was only the world ofMatter, the sand and the stone and the volcano and the sea on the land belowand the sun and the moon and the stars in the sky above. If you watch and observe patiently for many more thousands of years, you will see something new emerging from the bare stone, something green, more living than brute matter: leaves, grass, bush,meadows, plants, trees, flowers. Whathas happened? The world has progressed and acquired a new potentiality calledlife? What is this Life? What is the main difference between Matter and Life? Unlike the stone which is closed upon itself, the life in plants is open andresponsive to the outer environment. Youmight have studied photosynthesis in your science course, how the plant absorbs sunlight, take carbon from the atmosphere, emit oxygen and make the nutrientsneeded for its growth. This is life or to be more precise, plant-life. The next important question is from where this life, this new potentiality has come,like an impossible green living miracle from the bare “dump” stone? Here there is a divergence of opinion between modern science and ancient Indian philosophy. According to Science, life is the result of a chance combination ofatoms and molecules. When the atomic ormolecular structure of matter acquires a certain complexity, life emerges. But from where? Science has no clear answersto this question where? 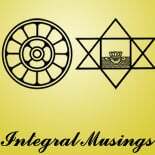 But according to Indian philosophy, life already existsin Matter as an unmanifest potential. Whenthe atomic structure of Matter acquires a certain complexity, it manifests andcreates the living matter of the plant. We must note here this Indian idea is not entirely unscientific. An eminent Indian scientist, Jagdish ChandraBose has proved by rigorous experiment that the potentiality of life exists inMatter in a rudimentary form. We are nowin a better position to understand the meaning of Evolution and a firstindication of an answer to the questions we are discussing. The essence of evolution is growth,progress. And the essence of thisevolutionary growth or progress is the emergence or manifestation of apotential which has remained hitherto dormant, involved or unmanifest. Life which remained involved in the stone hasevolved and become the plant. What was the next stage in this evolutionary progress of Matter? If you continue witnessingthe journey of evolution for some more thousands of years, you will seeappearing in this unseeing world of stone and plant, something moving withcurious eyes. Our many-legged, or legless or winged brothers; reptiles, birds, animals, big and small, from thetiny insect to the huge dinosaurs; crawling, hopping, flying, running. Thus after the plant came the animal with ahigher potentiality than the plant. While the plant can only respond to the environment, the animal can“sense” the world. They have asensational mind which can see, touch, smell and hear and quite possibly feeland have similar emotions like us. And again, if you still continue witnessing this aeonic spectacle of evolution one day youwill see an animal, perhaps a monkey or a gorilla, stands erect, looks up in tothe sky, and becomes, —Man. According to historians, Neanderthal is one of the earliest and the most primitive typeof man. And the Neanderthal who is probably a hunter, has progressed fast to become the agriculturalist, trader, warrior, king,industrialist, engineer, doctor, thinker, writer, poet, artist, philosopher,sage; producing, building, creating, inventing, thinking and seeking for theinvisible realities beyond the senses. So after the animal came we, the humans, with a thinking self-consciousmind which cannot only sense things but can think and asks questions like theone we are discussing, “why the world exist” which the animal can never ask. This brings us to another important difference between the scientific and spiritualconception of evolution. According tothe scientific conception evolution is mainly evolution of outer form. But in the spiritual conception, evolution is mainly evolution of consciousness. Consciousness in matter evolves and becomesthe plant; consciousness in plant evolves and becomes the animal; consciousnessin the animal evolves and becomes the man. And this progress in evolution is in essence a progressive increase in consciousness. Plant is more consciousthan stone; animal is more conscious than plant; man is more conscious than the animal. Thus we can see that the world is not something stagnant but something evolving, progressive; it has progressed from Matter to Life and from Life to Mind. And from Mind to—where? Perhaps towards something which has a greater potentiality than the mind, some thing much moreperfect, beautiful, harmonious and divine than our human mind, another greatleap forward in consciousness towards a greater consciousness beyond the human mind? We can say the world exists because it is a grand divine experiment inevolution, progressing towards a great divine goal. There is life on earth because it is a stage in evolution. We human being, with our thinking mind, exist, because we and our mind are also a stage in evolution. But our human mind and human life are still very imperfect. This you can see when you study and observecarefully and attentively the world created by our human mind, which is aroundus and also the inner world of our thoughts and feelings. When you read the newspaper or see the Newsin TV you will have some glimpse of the world made by our human mind; it isfull of war, conflict, poverty, violence, exploitation, environmentaldegeneration. And the world outside is areflection of the world within us, because as a great modern seer has said, “Weare the world.” The world around, not the world created by Nature which is beautiful, but the world created by us isso imperfect, full of jarring conflict and ugliness because our mind isimperfect, full of selfishness, and negative feelings like anger, jealousy andvengefulness. We, human beings, individually and collectively, as a race, have to raise beyond our imperfect human mind to a greater and more perfect consciousness beyond mind, which isthe consciousness of the divinity within us, which is beautiful, harmonious,loving, and blissful. When we are ableto reach this higher consciousness beyond mind, live, act and create from thisdivine consciousness, we will build a world which is free from war and conflictand poverty and which is true, beautiful, harmonious and perfect. This is the next step in human and planetaryevolution. This is the reason why the world exists and life appeared on earth. Why the school exists? For you to study and learn. Why the playground exists? For you to play. Why the world exists? For us to grow and evolve towards the divine perfection within us and help the world to grow towards its own similar divine perfection. The world around us is a larger school which provides us with the experiences needed for our growth andevolution towards the divine goal. Thesmaller school where you study must help you to learn the art and science of evolution which means how to learn, grow and evolve in the larger world-school. This entry was posted on April 27, 2013 by integralmusings in Education & Learning.